I keep making these salads that would be perfect in warm weather. Granted, it was 75 here last weekend, so I guess that would qualify as warm for January. Recently I heard about mini-cucumbers, or Persian cucumbers. I hadn't noticed them in my local grocery store, but I found them, not with the regular cucumbers, but in the "fancy packaged vegetables" section. You know, the neighborhood where the baby carrots and skinny green beans in their steam-in bags live. So I picked up a package. It totally is not salad weather today (I have a pot of soup on) - we have gotten 7 inches of rain in less than 24 hours, and it was thundering and lightning all night. So what do I make? A salad. Very tasty, too. Mix together the oil, vinegar and ponzu. Dress the sliced cucumber and sprinkle the Togarashi on top. I admit it. I love to tweak other people's and publication's recipes. Maybe it's an ingredient subsitution, maybe it's adding something that I think will make it appeal more to me and The Aussie, maybe it's doubling the veggies to make it more filling... there are many reasons. Every week there is a recipe in the Weight Watchers flyer that we receive at each meeting. The recipe in last week's was for pearled barley sauteed with grape tomatoes and arugula. I made my version with farro, because I didn't happen to have pearled barley. After I tried a few bites of it, I decided it would be better as a cold salad, so I stuck it in the refrigerator. Having just had a serving for breakfast, I can safely tell you that yes, it is a very tasty cold salad. Cook the farro according to package directions. Drain when cooked, and set aside. Spray non-stick pan with olive oil cooking spray. Over medium high heat, sautee the garlic for a minute (don't let it burn) and add in the halved tomatoes. Cook very briefly if you're doing this as a cold salad, maybe a minute or two. Add in the cooked farro and cook for another minute. Finally, add in the arugula leaves and stir until they are wilted. Refrigerate until ready to serve. Before serving, mix the oil and vinegar together with the black pepper, and toss together. I don't recall ever eating sweet potatoes when I was younger. I was probably in my late 20s before I tried one (I'm not counting sweet potato casserole at a relatives house for Thanksgiving, either). Darned shame, if you think about it. Sweet, savory, healthy goodness rolled in to one convenient package. Usually I roast them in the pan, along with regular potatoes for The Aussie, when I roast meats. A trick I learned from one of my Donna Hay cookbooks is to place the meat on a rack above the pan. The potatoes cook in the meat drippings. Sweet potatoes get browned on the bottom but are still soft. The white potatoes turn golden brown and crispy all over. Totally drool-worthy. 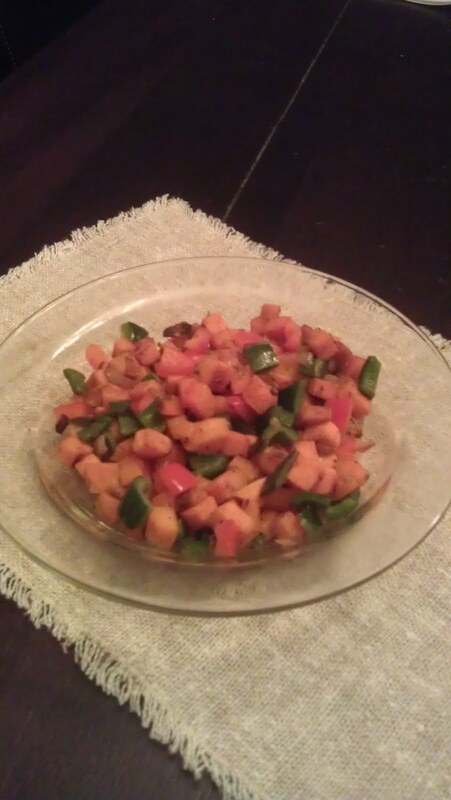 A while back, one of my foodie friends mentioned curried sweet potato hash. Curry+Sweet Potatoes=Awesome. I've tweaked my version a bit to use what spices I have on hand. Served with a fried or poached egg on top, it's nothing short of delicious. Heat a large skillet over medium high heat for a minute. Add 1 T of oil and swirl around to coat the pan. Add the sweet potatoes and season with salt and pepper. Cook the potatoes, try not to stir too much since you want some brown on them, until they're just getting softened. This may take about 10 minutes or so. Remove the potatoes from the pan and set aside. Scrape any stuck bits off the pan with a spatula or paper towel. Return the pan to the heat and add the remaining oil. Add in the cumin, coriander and fennel seeds to the pan and cook for a minute. Add in the diced onion, red pepper flakes, ground coriander and the curry powder, stirring well. Cook for about 5 minutes, or until the onion is softened. Stir in the garlic, ginger, red bell pepper and poblano peppers and cook for a few minutes. Add back in the sweet potatoes, mixing them with the peppers. Squeeze in your lemon juice and stir. Turn the heat down and cover. Cook until the potatoes are fully cooked. This may take about 8 more minutes. While the hash finishes cooking, heat up a skillet to fry some eggs to serve on top of the hash. When the hash is done, spoon out on to plates, top with the eggs and garnish with cilantro. 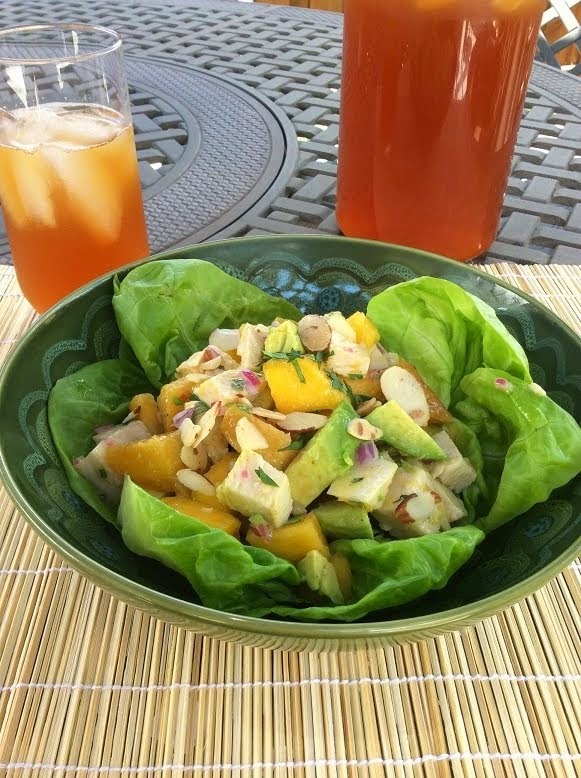 This is delicious and filling and works for breakfast, lunch or dinner. I have to admit, the first couple of days this week I ate really badly. Pizza, chicken fried steak, and lots of wine. I'm not sure the chicken fried steak with cream gravy was worth the 18 WW points, but man, it tasted great. I allowed my self a couple of days to indulge in comfort food because I'm really missing The Aussie. 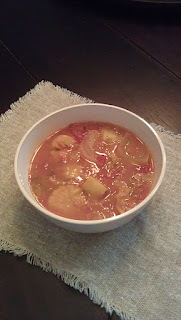 Last night, however, I took ahold of the reins and made an amazing (and amazingly large) batch of bouillabaise. If you aren't familiar with this soup (like friend who thought I said "boullion base"), it's a French fish and shellfish stew that tastes like healthy comfort in a bowl. This made 14 cups, and in WW's recipe builder, it totalled 3 points for 14 servings or 4 points for 12 servings. Note: thinly slice the leeks and then wash them very, very well. They are notoriusly dirt, so you want to make sure you get all of the grit out. In a large dutch oven or soup pot, heat over medium high heat for a minute. Add the oil, then the leeks, stiring for a minute, then add the garlic. Cook until the leeks are soft, at least 5 minutes. Stir in the fennel and cook for 2-3 minutes more. Add in the clam juice, stock, water, diced tomatoes, white wine, thyme, saffron and cayenne. (Some recipes call for orange zest, but I omitted). Bring to a light boil, reduce heat, and simmer for 10 minutes. Add the diced potatoes and cook until they are a little soft. This may take 15 minutes, depending on the size of the dice. Add in the fish, scallops and shrimp, and simmer until the seafood is opaque and cooked through, 8-10 minutes. Traditionally, you can also use more shellfish, such as oysters and mussels in your bouillabaise. Serve with a nice slice of hearty bread and a glass of wine. Perfect for a chilly night. When I signed on to FB this morning, one of the first things I read totally shocked me. An old friend that I knew back in the Northeast died yesterday. He fell from a ladder while working on his house. 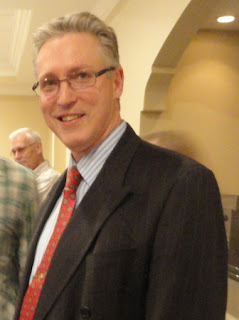 He was a wonderful guy, married to the sister of a very good friend of mine, and was the father of 13 year old twins. At only 51, he has been taken too soon. He will be sorely missed.